The core of most web sites are the regular pages. They inform people about who you are, what you do, and how to contact you. From the Home Page to About Us and Why Choose Us pages, through to Your Services, Terms & Conditions and other Policy Documents, Testimonials, Frequently Asked Questions and much more. We sit with you and work out exactly what pages you need in your website to inform your potential new customers and encourage them to contact you. If you sell products and would like them displayed on your website, we build you a Product Catalogue which you can log in and update as often as you like. Add, Edit and Delete items, upload photos and PDF documents and much more. Our Product Catalogues are designed from scratch based around your needs. If your products need multiple sizes listed or colours, we build that specifically for you. Adding the ability to sell items from your Product Catalogue online is easy. We can build a full shopping cart into your product catalogue so people can add your items into their cart, it will calculate the freight required and allow them to check out and make payment directly to you. 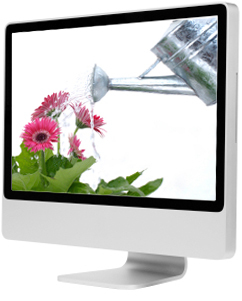 Many businesses require a Photo Gallery to help showcase their work, or products. The Photo Galleries we build allow you to log in as often as you like and add new photos for your customers to see. As soon as you upload an image, it's live on the web! As of July 2010, Facebook boasted half a billion (500 million) active users. We can assist you in getting your business profile onto Facebook, and link your website straight to it so people visiting your website can "Like" your Facebook Page straight from your site. We can also put Facebook and Twitter links on your site so visitors can share your pages with their Facebook and Twitter friends. A great way to keep your customers up to date with your business is by having a News or Whats Happening posting feature on your website. You can log in and add a news item any time you like. Producing a Newsletter in the past was often very time consuming and expensive. Our Online Newsletter features can do away with expensive printing and postage, not to mention the time it takes to put it all together. Simply create your newsletter in the program of your choice (Microsoft Word, Publisher etc), save it as a PDF and upload it to your website from your special admin area. Then email out your customers telling them to come to your website and read your newsletter. Because we custom build your website, whatever you need your website to do for you, or whatever features you need to have on your site (Event Calendars, Application Forms, Online Quote Forms, Videos on your pages etc)... just let us know what you need and we will work out the best solution.